Grillin’ and chilin’, a real warm-weather day. Puppy Louis spent all day outside, playing in the park and back yard, snoozing on the deck, and acquiring a fair number of burrs (luckily, they slide out of his fur pretty easily). We spent all day outside too, reading and…playing with Puppy Louis. I might even be a little pink, which is miraculous given that these days my sunbathing includes long sleeves/pants, a scarf, a hat, sunglasses, and a boatload of sunblock. The sun is not my friend, even though it makes me so very, very happy. 1. 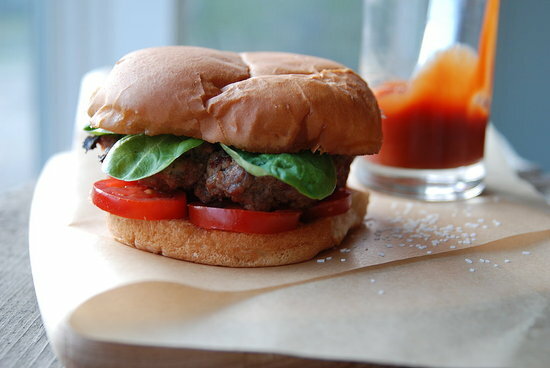 Buy best-quality ground beef, not too lean. 2. Gently work generous salt and pepper throughout the meat before you form the patties. 3. Gently form the patties (if you pack ’em, you puck ’em), until they just hold together. 4. Press the center of the formed burger to make it a bit thinner than the rest (the sides seize up as the burger cooks; a thinner center ensures even cooking). 5. As you cook them, do NOT press down on them (who started that? ), you’d just squish all the juicy goodness out of them. Thank you! Man it tasted good, I had a beer too, true summer feel. Loved it. And LOVE the winner of the Eat Your Words Challenge - great job! Good gravy, that's a beautiful burger!